As indicated in the chart above, there are so many business entities involved in the distribution of products, and when products reach the customer, “commission-over-commission” would inevitably make the retail price higher and higher. So it would be even higher to reach foreign markets. 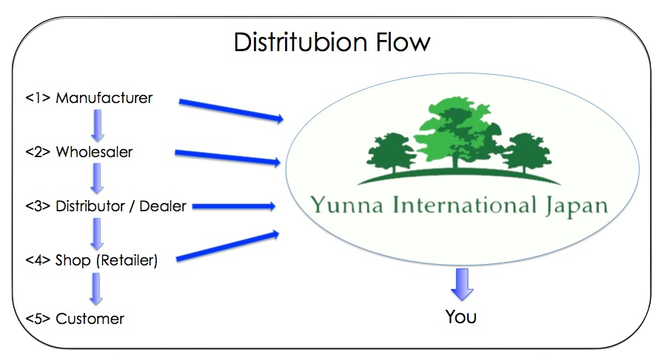 Yuuna International Japan, while displaying a part of products catalog on this website and providing them at the best possible price, will find the best sources for each product for your requests. Although the best sources for the best price are usually its manufactures (see the chart above), there are more than some cases that other entities such as dealers and even retailers could provide the better price depending on the item for various reasons such as their discount flexibility/ availability, stock situation and etc. Therefore, while serving you as the wholesaler/retailer and international shipping agent, we will provide you with the tailor-made services. For instance, if you are considering a purchase of a UV cream, we can first provide you with related products information from our catalog, and also we will make the relevant market research such as the Japanese ranking, user’s reviews and etc while timely providing the English translation about those products and its market. Do not buy any products until you become 100% certain that it will be profitable and successful. So please do ask us for anything about the Japanese cosmetics (as asking would not cost you anything). Deep into the second decade of this millennium, Japanese cosmetics are as profitable as ever. So, with much research, minute planning and marketing, it could definitely help your business success. We look forward to working with you.